As my wife and I walked the frozen food aisle of Whole Foods this morning, I slowed down as I passed it: Talenti gelato. This is one of my favorite foods…I will not refuse it even when I’m full. I’m Andrew Hardaway, the newest member of the UNC Center of Excellence in Eating Disorders and a post-doctoral fellow in the Department of Psychiatry. In trying to understand my own feeding behaviors, I’m no longer content with the age-old, guilt-ridden argument that I suffer from a lack of will power. A host of clinical and basic science research now demonstrates that my behavior is hard-wired within conserved neural circuits made up of neurons that express a cocktail of unique molecules that promote their activation and suppression. To understand what these molecules are and how they modulate neural circuits, neuroscientists need model systems that allow for genetic, physiological, and behavioral manipulations. In this first lesson from model systems, let’s talk Caenhorhabditis elegans. 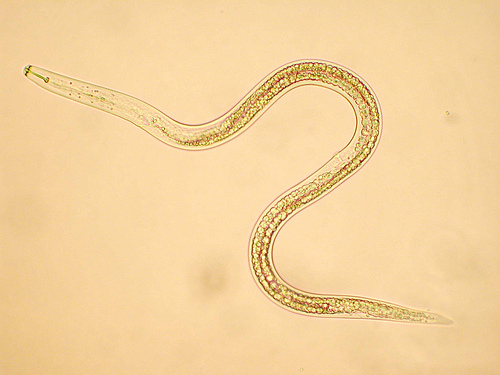 This species of soil-dwelling nematode is ~1 mmlong, transparent, self-fertilizing, and contains exactly 959 cells, 302 of which are neurons. It was one of the first multicellular organisms to have its genome fully sequenced and published in 1998. Following the publication of the first draft of the human genome sequence in 2001, geneticists have now determined that at least 40% of the genes in the worm have a direct human counterpart. In other words, the worm can be used to reveal the function of genes expressed in human tissue, including the brain. So what are the gustatory vices of this simple worm? In the wild and in the laboratory, they sustain themselves through consumption of bacteria like E. coli that naturally occur in the soil or can be grown on an agar matrix in a petri dish. In 2000, researchers in the laboratory of the Nobel Laureate H. Robert (Bob) Horvitz, published a landmark study that has transformed my understanding of how evolutionarily ancient and hard-wired the “need to feed” is. Sawin and colleagues found that worms that encounter a thin lawn of bacteria will slow their locomotory rate – a behavior they called the “basal slowing response” (BSR). Moreover, they found that worms that underwent a brief starvation before encountering the food would exaggerate this slowing. The researchers dubbed this behavior the “enhanced slowing response”. In a series of elegant genetic experiments, the authors demonstrated that the neurotransmitter dopamine (DA) was specifically required for BSR, while the neurotransmitter serotonin (5HT) was required for the ESR. Put simply, these studies suggest there exist primordial motivated behavioral responses to food and that these are genetically encoded through DA and 5HT signaling. To anthropomorphize, DA and 5HT act as instructive signals that say “Slow down. Slow down. This looks tasty.” These studies have now spurred ongoing research to comprehensively understand the genetic mechanisms by which C. elegans orchestrate BSR or ESR. Importantly, nearly all of the genes identified to date that mediate BSR or ESR have a direct human homologue. Critics may point out this line of basic science research does little to improve the lives of those suffering from eating disorders (ED). This is a worm after all. They point out that more research is needed to develop new behavioral or pharmacotherapies for ED patients. While I won’t disagree with the latter point, I would point out that selecting new targets for pharmacotherapies is perhaps more important than the development of the drug itself. The selection process relies on a host of preclinical studies in cultured cells, invertebrates, and mammals to inform on whether a protein is “druggable” and has therapeutic efficacy. Due to the ethical and practical considerations of genetic manipulations in mammals, C. elegans will continue to be at the vanguard of studying gene function in the context of motivated behaviors like feeding. Remember this the next time you slow down as you walk the frozen food aisle. 1. Sawin, E. R., Ranganathan, R. & Horvitz, H. R. C. elegans locomotory rate is modulated by the environment through a dopaminergic pathway and by experience through a serotonergic pathway. Neuron 26, 619–631 (2000).